The SmartView Multiscreen SVMS4DVI-DUAL DVI Video Switch is an advanced DVI KVM switch that enables 4 computers to be controlled by a shared keyboard, mouse and DVI (Digital Visual Interface) display system. The SVMS4DVI-DUAL enables a keyboard, mouse and 2 DVI monitors to control 4 computers. 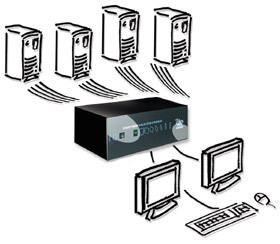 Each computer may supply two DVI signals and the display system may consist of up to two separate DVI monitors or a single very high resolution DVI display being fed by several DVI signals. The SVMS4DVI-DUAL supports the Digital Video Interface which ensures pixel perfect display accuracy and superb quality crystal clear video pictures. The ability to drive multiple monitors or feed multiple DVI links to very high resolution monitors makes the Multiscreen DVI suitable for a wide range of diverse applications from banking and security to geographic mapping and medical imaging. The SmartView Multiscreen supports standard PC style (PS/2) keyboard and mouse connections. Adder's CCUSB and CCSUN cables may be used to connect the switch to computers with USB or Sun (8 pin round) keyboard and mouse connectors. The Multiscreen DVI may be synchronized with other Adder analogue, DVI and Multiscreen products to support applications that require synchronous switching of large numbers of video channels. Autoscan of all or active ports with selectable dwell times. Screen saver feature with selectable "kick in" time. User selectable keyboard hotkey combinations. Video may be disabled (channel zero selection). Ability to cycle between computers using hotkeys plus TAB. Computer Selection Computers may be selected using the front panel key, keyboard hotkeys, a three button mouse or wheel mouse, RS232 data commands or the optional remote controller. Video Two or four single-link DVI ports operating up to 165MHz the full DVI Specification, VESA DDC2B signaling supported. EMC Complies with European EMC directive 89/336/EEC. CE marked. FCC class A compliant.